Filippo DiNuoscio first appears in the Painesville, Ohio, area from 1905 to 1918. Filippo DiNuoscio was born on April 13, 1879, at Frosolone, Italy. Filippo DiNuoscio immigrated to the United States on May 8, 1905, at age 26, travelling to Fairmont, Marion County, West Virginia. He was joining his uncle, Carlo DiNuoscio, in Fairmont. 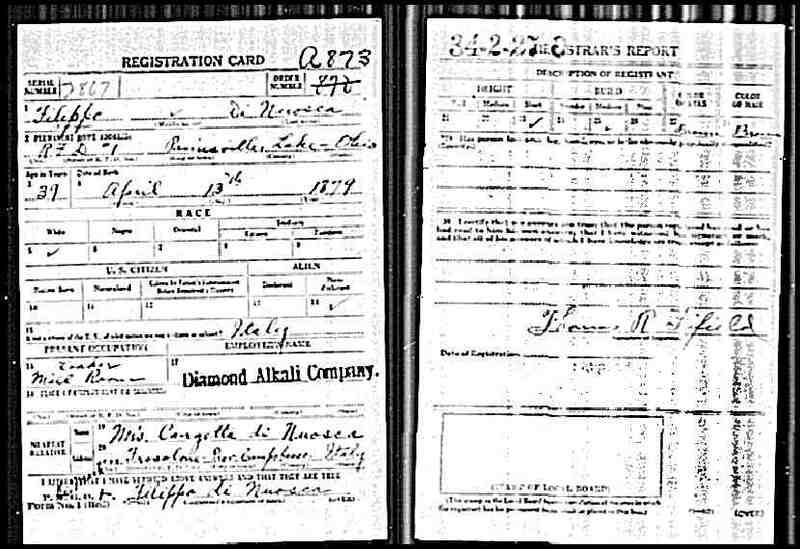 Filippo DiNuoscio registered for the World War I Draft on September 12, 1918. He was living at Painesville Township, Lake County, Ohio. Filippo was employed by the Diamond Alkali Company as a laborer.